Linda Rasmussen has had a lifelong love of sewing and needlework of all kinds. She started making clothing in middle school and attended Iowa State University in Ames, Iowa, where she received a Bachelor's of Science in Home Economics. After moving to Southern California in the 1970's, she began quilting and was hooked. Since that time, she has taught classes locally in many methods and techniques related to quilting. 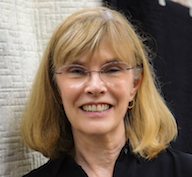 In 2001 she began to judge quilt shows and has taken both the NQA Short Course on Judging and the Northern California Council of Quilt Guilds Judging Course. In her spare time, Linda takes classes from many nationally known quilters to expand her base of knowledge of quiltmaking of all sorts. Traveling to quilt shows across the nation is also one of Linda's passions. She loves to see what is new and exciting in the world of quilting. Linda is an award winning quilter who has exhibited at Road to California in Ontario, California, and at the AQS Show in Paducah, Kentucky. Most of her work is traditionally-based, but she continues to explore her artistic side with new and experimental techniques.